This creamy, addictive Beer Cheese Dip recipe belongs on your party menu! It makes a huge batch so there’s plenty to go around, and it’s easy too! With football season back in full swing, it’s time to make sure you have some great options for your Game Day menu. Even if you aren’t going to a “formal” gathering to watch the game, you can still prepare a fun snack to make the day more enjoyable (bearable?). And for that matter, if you hate football (and/or all sports) you may still like dips. This Beer Cheese Dip is a great one to have in your back pocket for that moment when you are craving something fun and tasty but have no idea what to make. This Beer Dip is incredibly easy (two cheeses, dry ranch mix or packet, BEER, chives or scallions, garlic powder) and is delicious served with pretzels, chips, or crackers. The recipe calls for three (3) blocks of cream cheese. That’s 24 ounces of cream cheese. 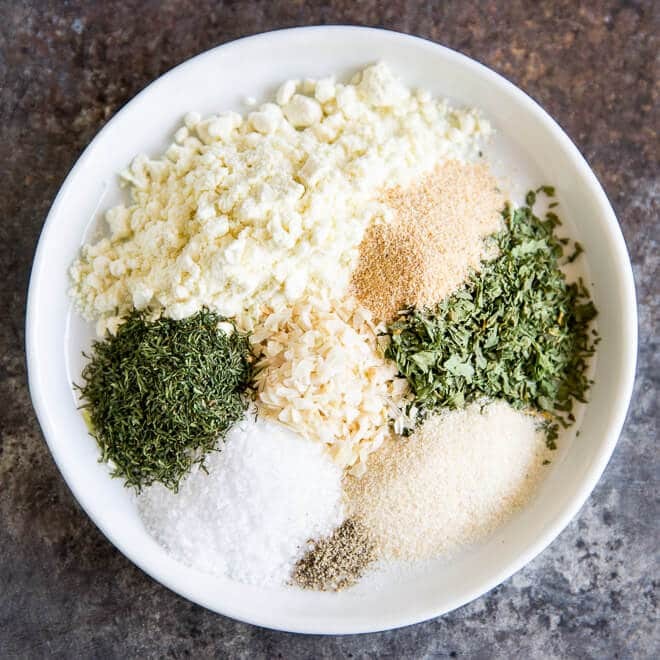 Obviously you can scale the recipe back if you are willing to divide a packet of the dry ranch seasoning mix as needed. Everything else is pretty easy to scale down. Softened (room temperature) cream cheese is essential for easy blending. To make this even easier (or if you won’t have time to let the cream cheese soften), substitute equal amounts of whipped cream cheese. Save this Beer Cheese Dip to your “Appetizers” Pinterest board! This creamy, addictive Beer Cheese Dip recipe belongs on your party menu! It makes a huge batch so there's plenty to go around, and it's easy too! 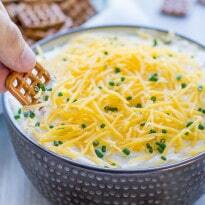 Combine cream cheese, cheddar cheese, ranch mix, beer, and chives in a large bowl and mix well. Add garlic powder to taste, starting with 1/2 teaspoon and adding more if desired. Cover and chill at least 30 minutes to blend flavor. Serve chilled with pretzels, chips, or crackers. Reduced fat cream cheese is fine here! Sounds delicious! I just dot some dry ranch and will definitely try it this weekend! Thanks for sharing! Thank you so much, Mira! I hope you love it as much as I do. I just threw this together to go with our bacon bombs. I didn’t have any chives so I subbed onion powder. Super delicious. I can’t stay out of it. Does it matter what kind of beer you use? I make this delicious dip for all my parties and my guests love it. they always come in and scope out where the beer dip is. Hi, Haley! Like maybe taco dip and beer dip had a baby? Or do you want something with a layer of refried beans (or corn), or guacamole? Happy to experiment, there is NO WAY this could end badly! Just hoping to give you what you want. Please let me know if you get a chance! I feel like adding some taco seasoning to this recipe as-is would be delicious, but I’m not sure if that’s what you had in mind. You are totally feeling my vibe with beer dip and taco dip having an illegitimate love child. I want to keep the texture and consistency of the beer dip, but give it a Mexican spin. I thought about maybe asking taco seasoning and taco sauce or a smooth salsa?